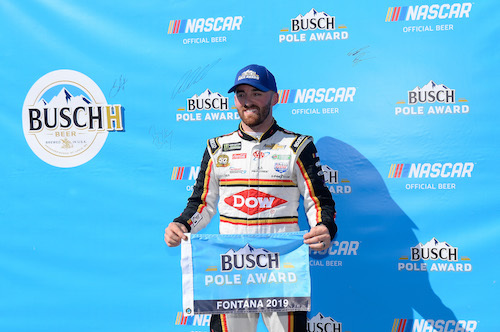 A 39.982-second/180.081 mph lap during Monster Energy NASCAR Cup Series qualifying at Auto Club Speedway in Fontana, Calif., on Friday earned Austin Dillon the pole for Sunday’s Auto Club 400. It’s Dillon’s fourth-career Cup Series pole and his second at ACS. Although Friday’s qualifying session went three rounds, Dillon’s pole-winning lap came in the second round. With drafting coming into play Friday, drivers didn’t want to be among the first to go out for a lap in the final round. All 12 drivers who advanced to round three waited too long to go out onto the race track, and as a result, none of them posted times in the round. 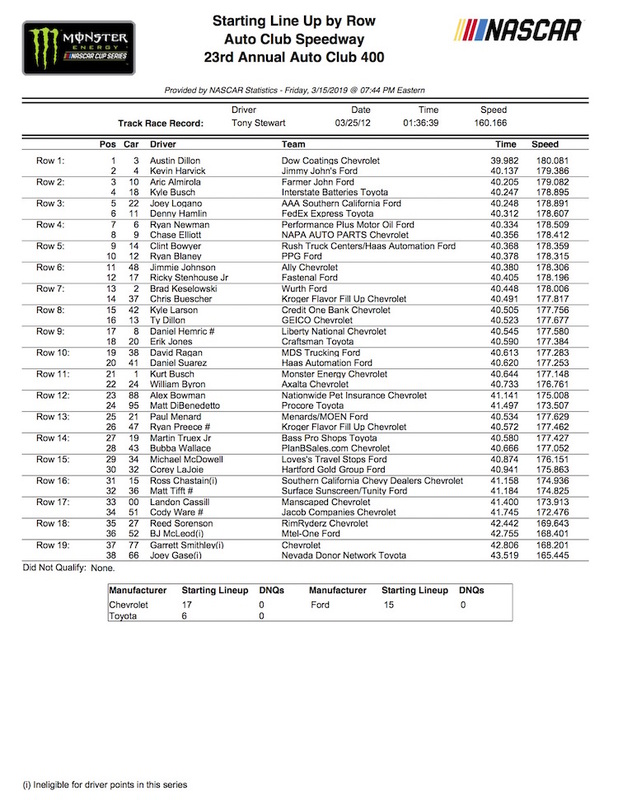 NASCAR set the starting order of the top-12 by the round-two laps that advanced those drivers to the final round. Based on second-round laps, Kevin Harvick qualified second to join Dillon on the front row. Harvick’s Stewart-Haas Racing teammate Aric Almirola qualified third and will share row two with Kyle Busch. “We do the best that we can to try to put ourselves in the best position, and it was just a handful today,” Harvick said. Joey Logano qualified fifth, joining Harvick and Almirola to give Ford three cars in the top-five of the starting grid. He’ll shared the third row on the grid with Busch’s Joe Gibbs Racing teammate Denny Hamlin. Dillon’s round-two lap that wound up being his pole-winning lap was the only lap of the qualifying session that clocked in under the 40-second mark. Dillon also led the opening round with a 40.11-second/179.951 mph lap. Logano was second to Dillon in the opening round. Chase Elliott brought out the red flag with a spin in the opening round but still managed the third-fastest lap in the round to advance to round two. He wound up qualifying eighth.